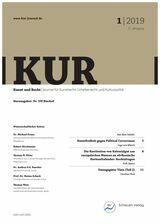 The journal KUR - Kunst und Recht deals with the intersections of art and law, questions of art law, copyright and cultural policy issues. It serves as an international forum for professionals engaged in cultural work - artists, collectors, and also lawyers, insurance companies, currier services, finance professionals just to name a few. KUR - Kunst und Recht highlights legal and ethical problems, provides insight into current practice and lessons learnt from museums, insurance companies, shipping companies, auction houses. KUR - Kunst und Recht has an interest in authenticity issues as well as the protection of cultural property, the reestablishment of pillaged and looted art and realistic concepts of financing art production and collection.